The Villa invites guests to succumb to the pleasures of the luxurious island living experience and enjoy unobstructed views to the emerald waters of the sea. 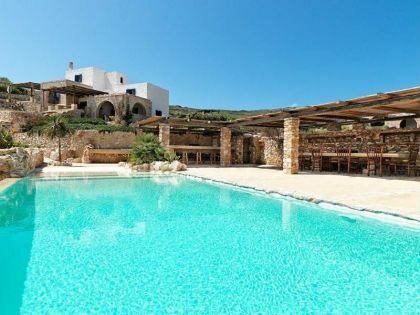 Set in a secluded tranquil setting 100 meters from the beach in the quaint fishing village in Paros this marvelous villa ensures a relaxing escape for discerning travelers seeking the true island feel of privacy and refined comfort. The Villa offers a tranquil retreat for luxurious island holidays. The main entrance leads directly to a beautifully appointed open plan area featuring the vast living room, the elegant dining room and the brilliantly white fully equipped kitchen all fitted with contemporary amenities and conveniences for a truly enjoyable stay. At the lower floor there is the master king size bedroom with en suite bathroom, a single bedroom and a queen size bedroom sharing a bathroom with a shower. A small kitchenette on the hallway allows guests to enjoy a quick espresso or snack. A separate guest house with a double bed and a private entrance on the side of the villa can be used as a room for the stuff as well as for extra guests. The profuse vegetation encircling the villa creates an atmosphere of pure tranquility and bliss. Guests can unwind at the sun kissed patio as the lay on the comfortable sun beds or the stone build day bed overlooking the country side and the sprawling verdant fields. The beautiful dining area and lounger on the large veranda invite guests to relax under the shade of the pergola and relish local specialties as they gaze at the azure sea. Rent this for luxurious privacy ideal for family holidays, romantic getaways and relaxing escapes.